Fanad United, pictured before their cup win over Swilly Rovers. A last gasp header from captain Darren McElwaine saw holders Fanad United reach the semi finals of the Colin Breslin Cup after overcoming Swilly Rovers in the preliminary round. It was a game of few chances that was played in ideal conditions. The best chance of the first half fell to Padraig McGinty in the 35th minute when he headed over following a Bernard McGettigan cross. The second half followed the same pattern as the first with both teams enjoying spells of possession without creating many chances. In the 65th minute Fanad did have an opportunity to open the scoring when Keelan McGroddy pounced on a back pass and he attempted to lob Jamie Lee Blaney who got back onto his line just in time to collect the ball. Five minutes later Conor O'Donnell flashed a cross shot across the Fanad goal. As extra time looked inevitable, Fanad clinched the win. When a corner was cleared the ball fell to Paul Bradley on the right and when he swung a superb ball into the box, Darren McElwaine powered his header home. 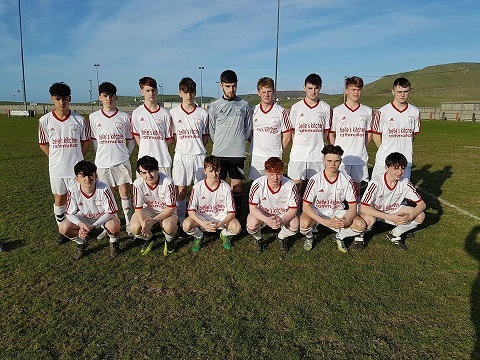 Fanad United will play either Dunfanaghy Youths or Letterkenny Rovers in the final of this competition after they beat Bonagee 4-3 in their semi-final. Bonagee's goals were scored by Dylan O’Brien, Adam Hannaway and Peter Carr. Fanad goals came from Conor McHugh,Darren McElwaine and Keelan McGroddy with two.